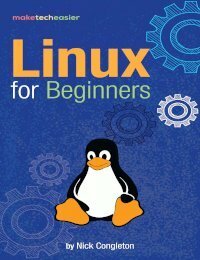 The first step in working on a project as a group is to collect resource material. This is often done by project members collecting relevant URLs and sharing them with each other. A highly effective way to get this done is through online note-taking applications that support note-sharing and collaboration. Not only do these apps assist project members, but also individuals who want to quickly record notes and share them with friends. While the web has numerous such apps to offer, most of them require lengthy signup procedures and complicated sharing and collaboration options. 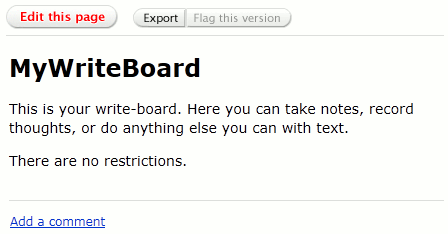 Thankfully, “WriteBoard” is an exception to that rule. 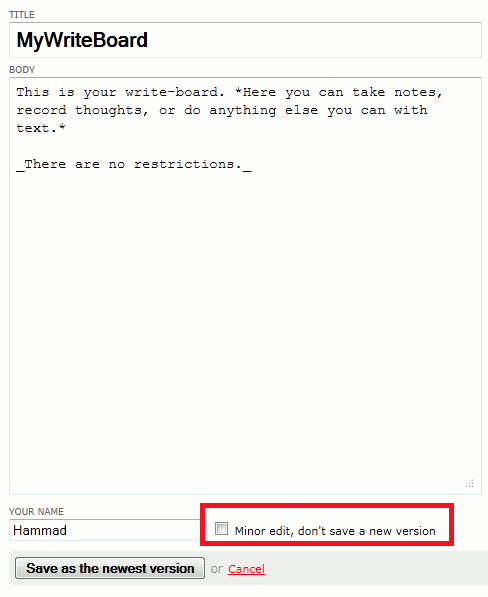 WriteBoard is a wonderful and, to my surprise, a free web service by 37signals. The service lets people take notes on virtual write-boards and share them with friends. Additionally the site lets you edit notes, supports bold and italics formatting, and exports your notes to TXT and HTML files. 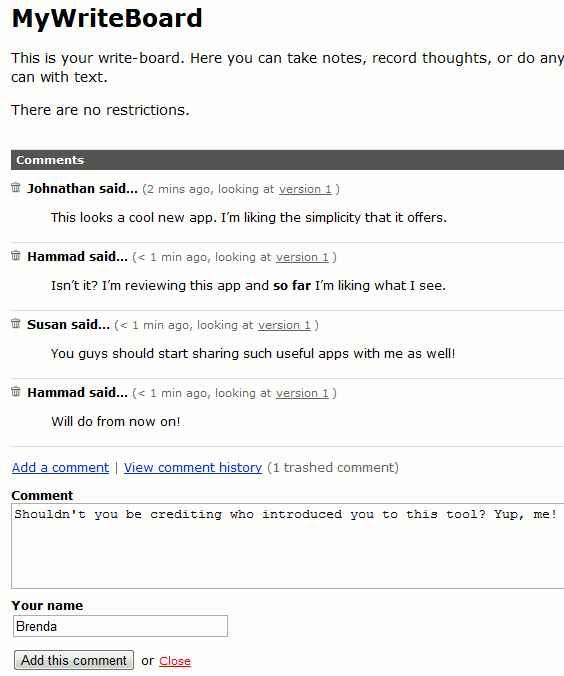 WriteBoard works flawlessly on Internet Explorer 7, Safari, Google Chrome, and Firefox. Unlike other collaborative note-taking web apps, WriteBoard lets you get down to business right on their homepage. 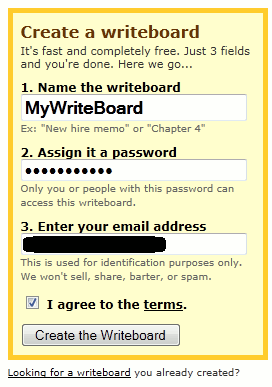 In the very first step you can name your write-board, enter your email address, and set a password for the write-board. After filling these details, you are taken to your virtual write-board where you can start noting down text. 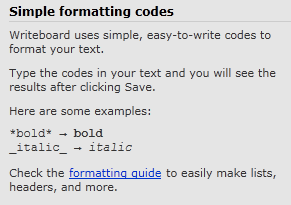 The writing pane lets you type in simple text format. But by using the special formatting options present at the right of the writing pane you can add bold and italicized text. 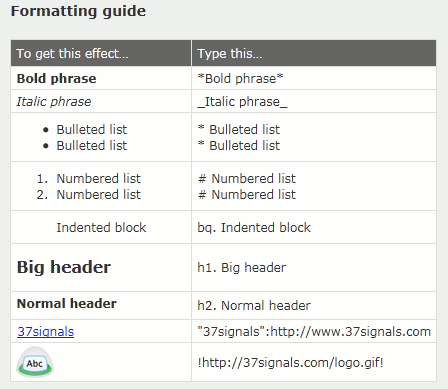 Click on the “formatting guide” to see how you can add more special formatting such as indentations and bullets. When you are done typing your note you can save it and have it published on a unique URL. 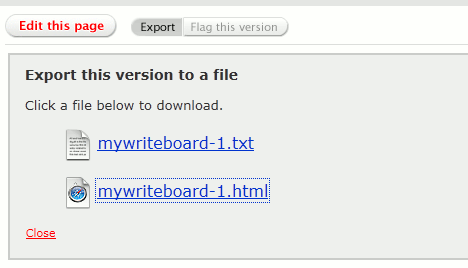 The “Export” button placed on top of your note let you export it to TXT or HTML files. In case you want to modify your notes, simply click on the “Edit this page” button on top to reopen the writing interface. Once you make your changes decided whether to save the modified form as a new version or incorporate the changes in the existing version; make this decision by checking/unchecking the checkbox located at the bottom. 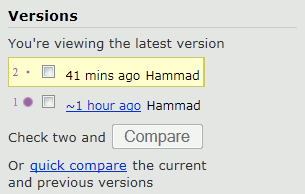 You can switch between different versions of your note using the links available in the right pane. You can start sharing your notes by using the share link in the top right of the webpage. This will display an email invitation interface where you can type in your friends’ addresses. 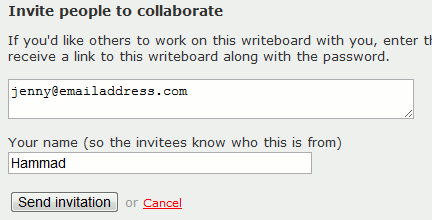 The link to the write-board along with its password will then be emailed to them. Visiting the emailed URL will require them to type in the password before they are taken to the whiteboard. Visitors to the whiteboard will be able to edit the notes just like you can, in addition to leaving comments. This facilitates collaboration. 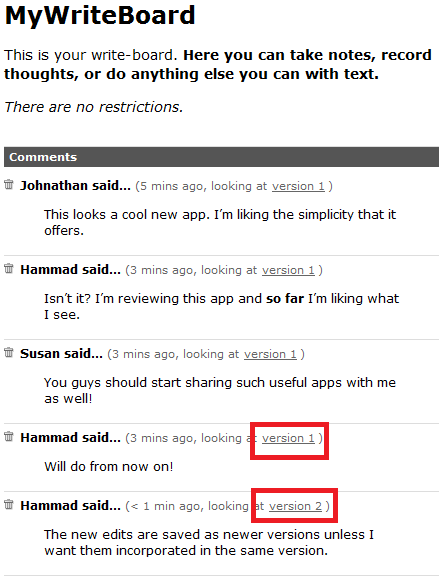 Along with the friend’s name and time of comment, each comment shows which version the comment was left on. WriteBoard is undoubtedly going to be a hit with everybody looking for a simple yet effective collaborative note-taking web app. The app is refreshingly different from its competition that often comes in complicated interfaces and accompanied by a price tag. 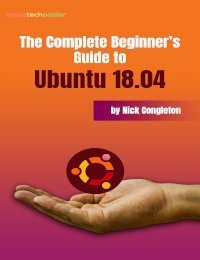 Anybody looking for a note-taking web app needs to look no further. You can visit WriteBoard by clicking here. Thanks for sharing useful information. Here is another website i.e Carrynotes which is very helpful for taking notes online. 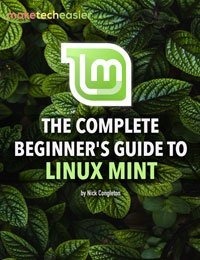 You can review http://www.carrynotes.com to remember, manage and keep track of your notes for free.